This post originally appeared on the ocTEL blog on 15th April and was written in collaboration with David Jennings. I’ve reposted it here as it outlines some of the broad ideas we are using with this open course, but in particular I wanted to highlight the use of the WordPress plugin MailPress to distribute course updates. The latest MailPress theme is here and the course theme customisations (a more detailed recipe is in the works). ocTEL has been up and running for over a week now. After a start where the momentum of the email discussion threatened to run away with itself, Stephen Downes, who is a ‘critical friend’ on the project, shared his advice to OcTEL. We’ve taken that advice to heart and this post outlines how we’ve sought to embrace his suggestions. When creating the ocTEL platform we were conscious of the need to push information to participants in a timely and useful way. From day one we had included the MailPress plugin for WordPress for distributing a daily and weekly newsletter. 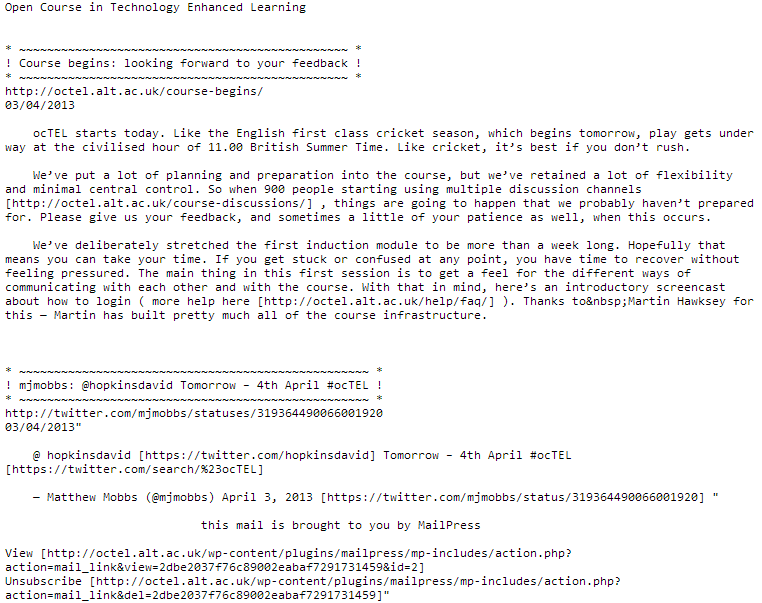 Below is a screenshot of the newsletter from day one sent on the 4th April. Other than there not being much content (it was day one) we recognised there were a number of areas to improve. Using some earlier work we’ve developed a custom ocTEL template (available here along with other source code from the project). The image to the right (which you can click to enlarge) gives you an overview of a recent version of the newsletter, which you can view online here. As the course evolves our plan is to refine the newsletter to maximise effectiveness. This will be in part to respond to the dynamics of the course, but also to experiment with different configurations and features. If you have any suggestions for these we’ve created a topic on the forum or contact us by any other means that you prefer. The ‘publish in your own space’ (or wherever you prefer) principle is at the core of our platform design and has directly influenced a number of our fundamental decisions including the adoption of WordPress. As part of the registration form we asked participants to include a link to their existing blog and these were imported into our platform from the start, after which participants could login to review and edit their details — as shown in the video below. This includes selecting an RSS feed so that we can aggregated their posts into our site allowing other participants to review content via the Course Reader or as part of the daily newsletter. Like a number of other open online courses we achieve this by using the FeedWordPress plugin for WordPress which has the ability to aggregate RSS data. In addition to this we recently developed the ability for participants to submit additional artefacts not accessible using RSS. As well as collection of data from participant feeds we are aggregating other feeds. These include the ocTEL JISCMail list, the Diigo group, Delicious bookmarks tagged ocTEL and others. Even though the course has been running a relatively short time, it’s encouraging to see individuals establishing new places for participants to cluster. As these are created, and where possible, we are adding them to the list of aggregated feeds. This currently includes the Google+ Community created by David Read and a Mendeley Group created by Ann Nortcliffe. Currently we are only aggregating a selection of tweets into the Course Reader using the search term ‘#ocTEL AND ?’ giving us a sub-selection of tweets which might be questions. Using a system developed for another open online course we attempt to match questions with answers. These are available in the Course Reader and in this dedicated page. 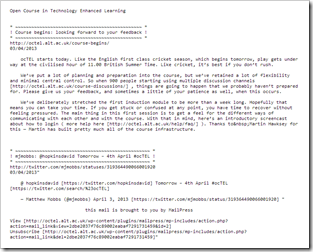 It is also worth highlighting that we are archiving all the course tweets using a Google Spreadsheet template. In an attempt to provide a way for participants to navigate and explore this data we have another dedicated page with a ‘conversation graph’. This was the one element of Stephen’s advice we haven’t yet followed. We trusted ocTEL participants to self-regulate and catch their breath of their own accord, and happily they did. We know that email discussion lists have the capacity to flare up suddenly, and that may happen again. However, our parent organisation ALT successfully runs an email list with a thousand members, and, at present, ocTEL’s list of just under 800 participants is going through a quiet phase.